Let us understand various types of inheritance with their example. 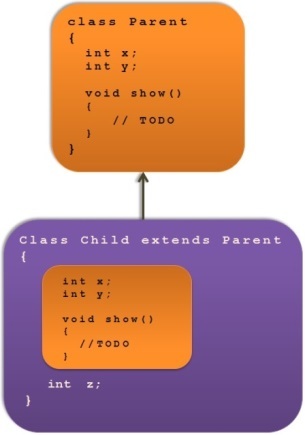 When one class extends only one parent class then it is called as Single level inheritance. It means it will have only one parent class and only one subclass. We can see the same in the below diagram. In this case, one child class extends parent class and that child class can become the parent class for the new child class. It means it will have multiple level in the <code>super and subclass relation. 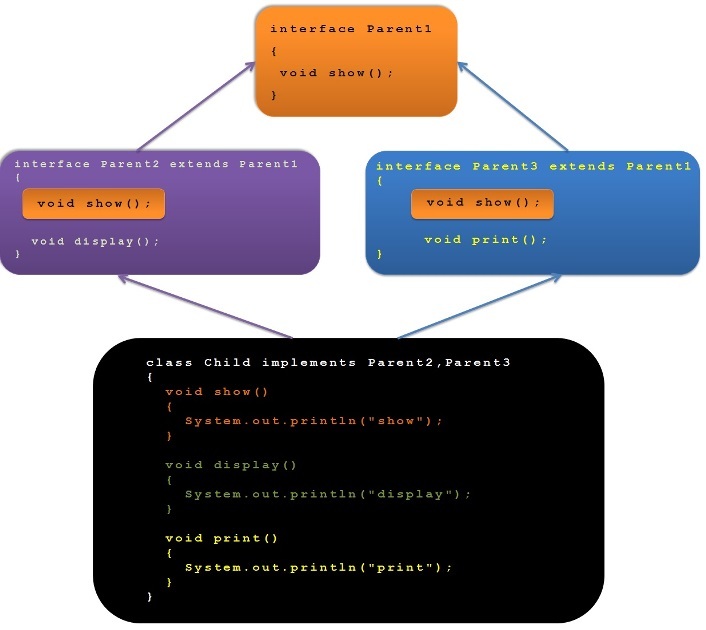 In this case, one parent class is inherited by multiple sub classes. It means all the sub classes will have a common Super class. Its a combination of single and multiple inheritance. In this case,multiple sub classes will have one super class and another class will have those sub classes as parent classes. Its also called Diamond shape inheritance as its structure looks like a Diamond. It can be achieved in Java using Interface only as Multiple inheritance is not supported in Java through classes. //Calling all methods inherited and implemented in sub class. In this case,sub class will extend multiple super classes or one interface extend more than one interface. 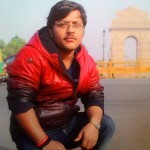 In Java, its not supported through class but it is supported through interface. Most of the object oriented languages like Java, c# do not support multiple inheritance as it involves lot of complexity and also it is very rarely used. Multiple inheritance through classes can cause ambiguity on inheriting method definition from parent classes if all of them have same method. Parent1 , Parent2 and Child are the 3 classes and “Child” class has to inherit from both Parent1 and Parent2 classes. 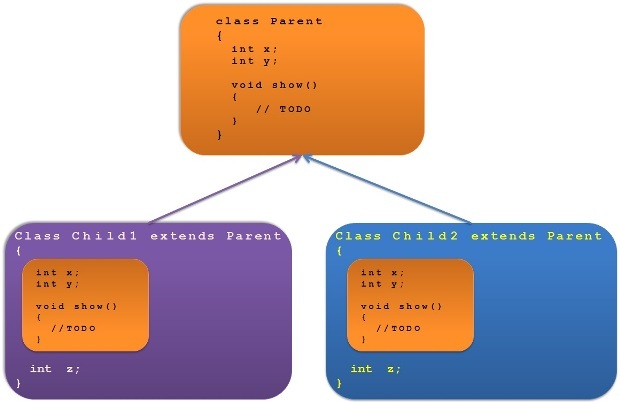 If multiple inheritance would have been allowed through class then Child class will be in ambiguity as it does not know which method it has to inherit(whether one from Parent1 or from Parent2). Why multiple inheritance is allowed through Interface ? If we have interface then, class which is implementing multiple interface will be providing the implementation for the method declared in those interfaces and hence it will not have any ambiguity while calling the method. 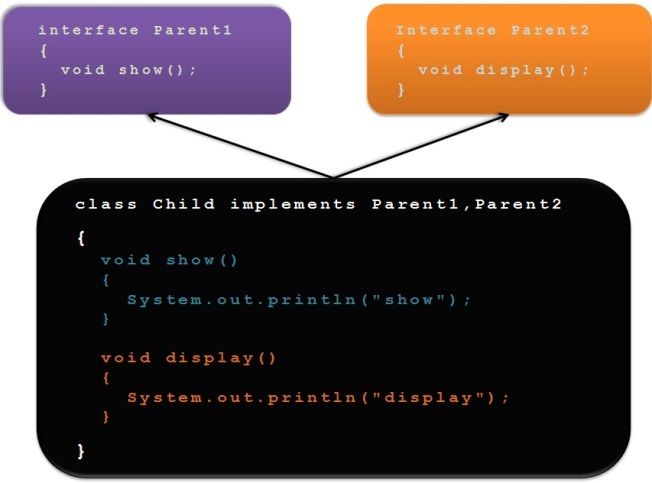 There is no ambiguity as it calls the method from “Child” class since its implementation is available only in the Child class.